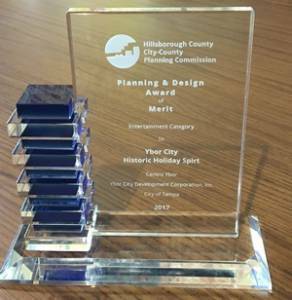 TAMPA, Fla. (Oct. 20, 2017) The Ybor City Historic Holiday Spirit program was awarded by the Hillsborough County City-County Planning Commission for contributing to a better quality of life in the community. The annual awards cermony is held every October to coincide with the American Planning Associations National Community Planning Month and highlights projects the Hillsborough County City-County Planning Commission considers as worthy of emulating for their contribution to a better quality of life. Centro Ybor, the YCDC and the City of Tampa, were honored at the awards ceremony for their work with the Ybor City Historic Holiday Spirit program which host a number of events in Tampa Bay’s National Historic Landmark District, such as annual Snow on 7th parade and the Centro Ybor Holiday Tree Lighting Ceremony. The 35th Annual Planning & Design were held October 19 at the TPepin’s Hospitality Centre.